When it comes to commercial espresso machines, you really have to give this La Pavoni BAR-T 2V-B a hard look. It’s a medium-sized machine that is a powerhouse in a location where you’re providing hundreds of drinks per day to customers. It has some fantastic features and the ability to really keep up with a demanding amount of drinks. Even if you don’t have a plan to craft hundreds of cups of espresso now, it can grow with your business quite easily. The group head is where all the magic happens. The portafilter is placed in the group and espresso fills the cup. This component is where all the functionality of the process comes to a head. The group-heads are made with press-forged brass and are chrome plated. They’re stunning while being fully functional and durable. There’s no need for group dripping with these heads, either. The pressurization system and infusion chamber allow for single dispensing within each head. The grind is infused in this area with a pressurized spring, which leads to the saturation of all the grind in the portafilter. 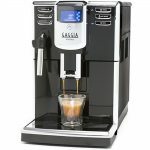 This system is vital for a rich espresso to benefit from an even dispensing system. Each group also has an independent radiator hydraulic system that delivers consistent water through the boiler. There’s actually a reason you want a copper boiler in your espresso machine. In ancient times, it was known that copper would keep water in better quality. It has natural properties that don’t allow microbes and bacteria to grow. While you will definitely be washing your boiler on a regular schedule, reducing the amount of microbes and bacteria will keep your customers in good health. It’ll reduce the need for you to worry about scrubbing and sterilizing due to problems. It’ll just be a part of your cleaning process. On the boiler of the La Pavoni BAR-T 2V-B, there’s a pressure gauge that will monitor the boiler’s water pressure. The steam wands work wonderfully for milk foam. When milk is turned into foam for a variety of espresso drinks, there’s a bit of milk that can enter the wand. While many machines require that you have to flush the wand to remove the milk, this one has an anti-vacuum valve. It doesn’t allow fluids to back flush into the system. You should still get into the habit of flushing the wand after every use, though. 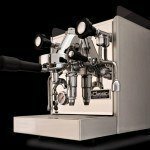 The capacity of your espresso machine should be perfect for the amount of coffees you plan on serving per day. If you’re operating a business that’s exclusively offering coffee, you’ll want a machine like this one that can handle the amount of drinks you’ll be selling per day. 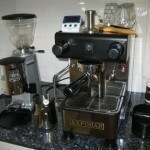 Between the group-heads and the boiler size, this La Pavoni BAR-T 2V-B is a good medium-sized machine. It’s going to serve all the customers of your medium-sized business. 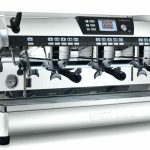 If you have hundreds of customers per day all ordering espresso, this will work beautifully since the capacity is up to 600 drinks a day. This espresso machine requires direct plumbing to work correctly. The espresso machine comes with all the tubes and a stainless steel water line to get this machine set up in your location. It comes with a water softener, too. You have to use this water softener to ensure that you are maintaining your warranty eligibility. If you don’t use the water softener, you’re actually voiding the warranty. This isn’t a cheap machine, so you don’t want to void your warranty in case something happens. What are the dimensions of this machine? The machine is 21 inches high by 30 inches wide by 21 inches deep. 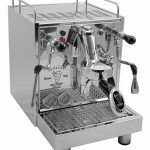 The La Pavoni BAR-T 2V-B weighs approximately 129 pounds. 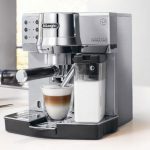 Where is this espresso machine made? It’s made in Milan, Italy. You can work that into conversations with customers as you make their drinks. They’ll love how exotic that sounds. This machine does need installation. You can’t just set it on your counter. It needs a dedicated power and water line. There’s a water softener that has to be installed, too. When it comes to mid-sized espresso machines for your commercial space, the La Pavoni BAR-T 2V-B is a good investment. It has many of the gold-standard features that produce incredible cups of espresso. This is a machine that will grow with your business. If you’re purchasing your first machine for a new business, know that this one will grow with you. It’ll stay with you until you outgrow a machine that can make 600 cups of espresso per day.